Tuesday June 11th 1901. I was busy most of the forenoon with the work and in the afternoon Will and I went down town. I took some things down to the banquet for the M. E. ladies. I made a last visit to Mrs McCord. We stopped at home. Hattie had just been over to Mrs Folsoms and said she was very sick. This is Grandmas birthday Wednesday June 12th 1901 Ida and I took an early start to pick strawberries got some for Mother and took them down to her. We began the washing after we came home. There was a hard rain about noon but got the clothes dry I was going down to Folsoms but the rain interfered. 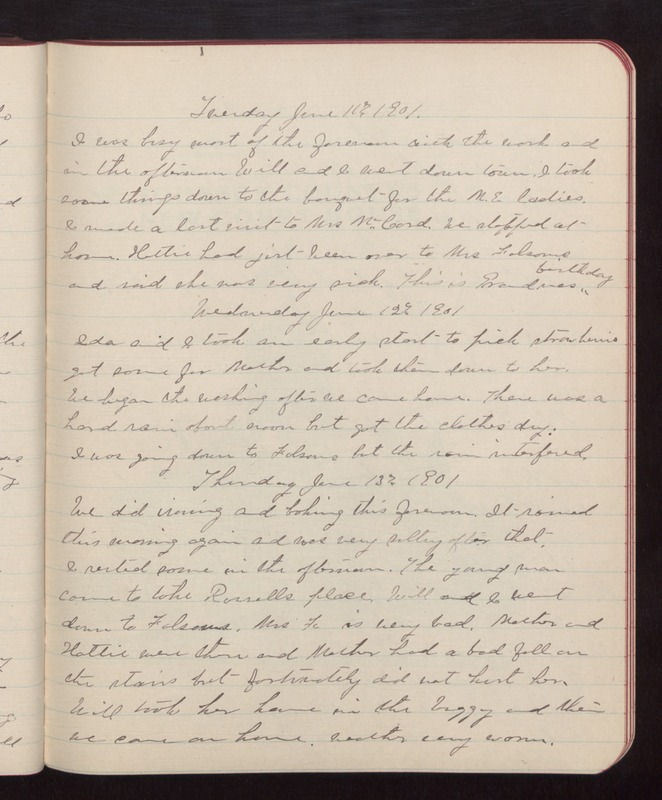 Thursday June 13th 1901 We did ironing and baking this forenoon. It rained this morning again and was very sultry after that. I rested some in the afternoon. The young man came to take Russells place. Will and I went down to Folsoms. Mrs F is very bad. Mother and Hattie were there and Mother had a bad fall on the stairs but fortunately did not hurt her. Will took her home in the buggy and then we came on home. Weather very warm.